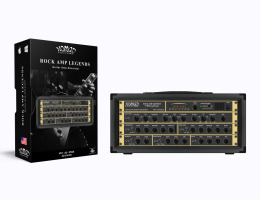 Designed by musicians for musicians, Rock Amp Legends also comes with a number of factory presets sure to find their place in your music. Plus, you can use the factory presets as a starting point for creating and saving presets of your own signature sounds.. The Bottom Line is even if you have used other guitar amp simulator plug-ins, get ready to be blown away by Rock Amp Legends. RTAS (Pro Tools), AU and VST plug-ins. RTAS (Pro Tools) and VST plug-ins.